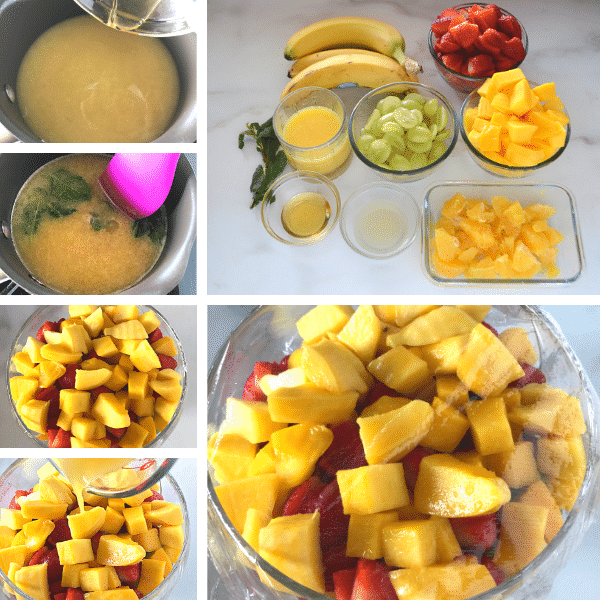 Easy fruit salad, healthy, simple and naturally sweetened. Feeds a crowd and perfect for any occasion. 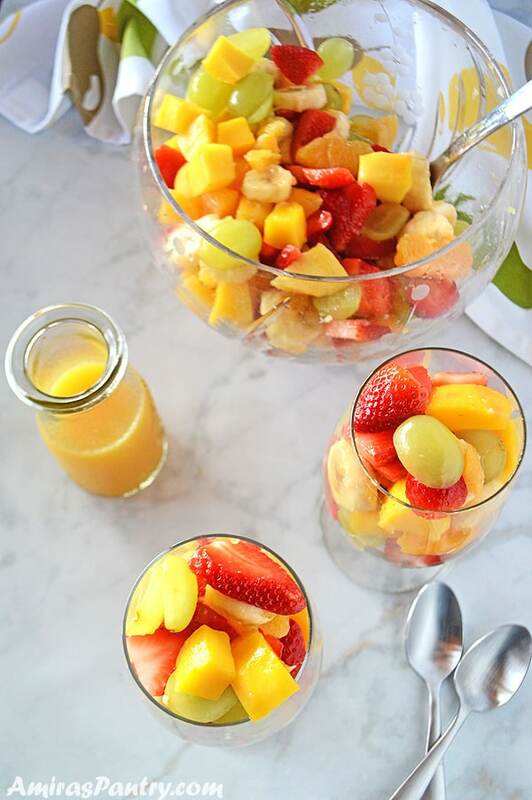 Fruit salad that is very simple to make, with the best citrus minty dressing. Naturally sweetened with honey and sugar from the fruits. This is a group party favorite healthy and light dish. Best part is, it is an effortless recipe. Fruit salad has been always a favorite for me since I was a little kid. When I was growing up, strawberries were the only berries we knew. Blueberries, blackberries and such were not common in Egypt back then and I believe still not that common. My mom is an avid fruit lover, so we would always have fruit salad at home even on the simplest form bananas and strawberries. In winter, my mom used to make a fruit salad from bananas, strawberries and oranges. In summer she would add mangoes and in some occasions diced apples as well. 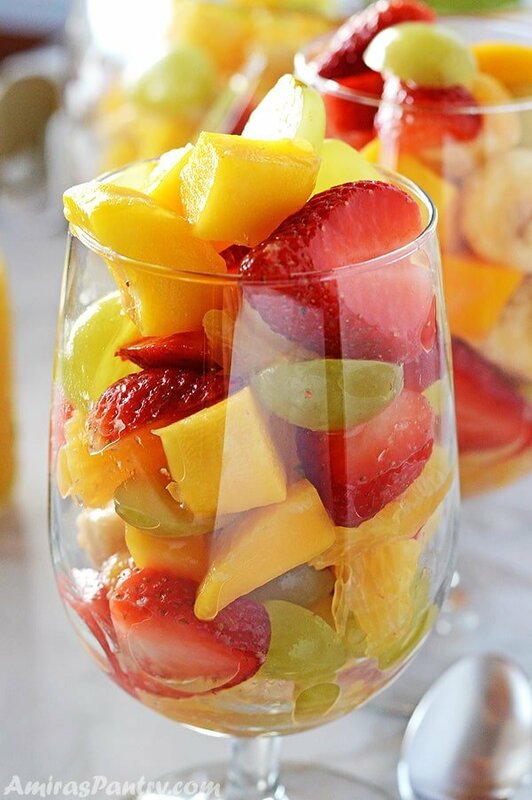 So this is my kind of fruit salad, luscious, sweet and so refreshing. My mom’s recipe was to sprinkle some sugar over strawberries and bananas with a squirt of lemon juice, keep it in the fridge for two hours then add any other fruits she would like to. I do not know why I did not like the notion of apples in fruit salad, although it is very common in Egypt. I’ve replaced the sugar in mama’s recipe with honey added some orange juice along with lemon juice and flavored it with mint. This recipe is very versatile, use whatever fruits you have and you can also flavor the dressing with vanilla, thyme, rosemary or basil. Which fruits go well together? Well, here is a guide for seasonal produce to help you. 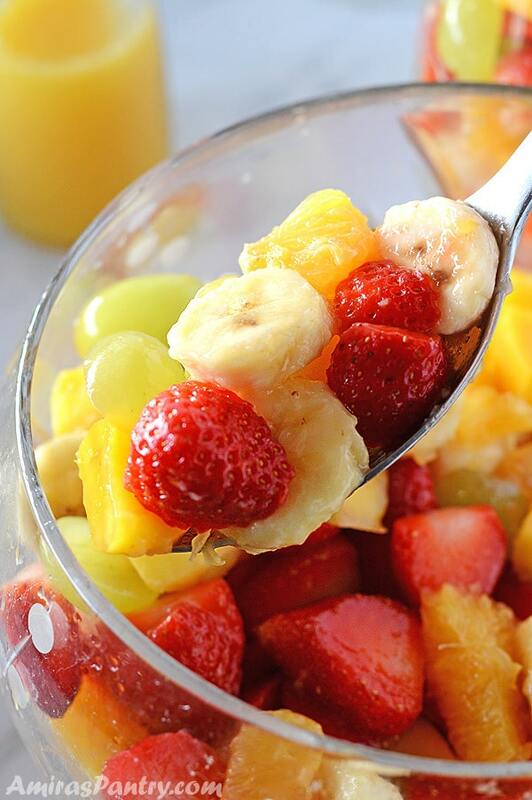 For me I like luscious juicy fruits, strawberries, bananas and oranges are a must. It is up to you of course, some people do not like bananas as they might get soggy and awkward. See notes below regarding bananas. My two suggestions for you is to use lemon juice and don’t cut the produce too small as fruits get mushy faster when then pieces are small. 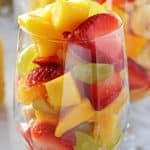 How long will fruit salad Keep in refrigerator? Usually fruit salads are good for 3-5 days refrigerated. 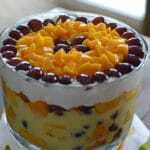 I find this fruit salad good for 3 days after that the fruits lose their crispness and become bland. 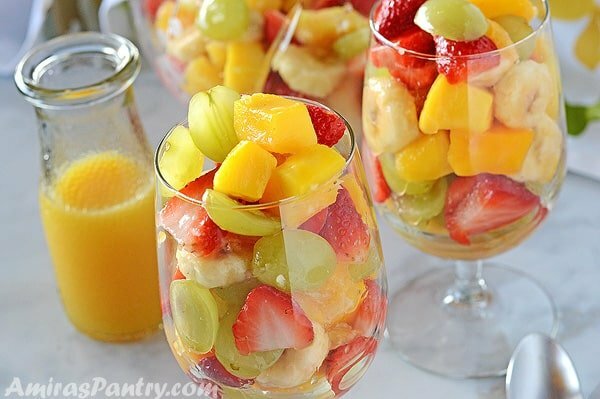 Easy fruit salad recipe that is effortless and healthy. Gather, chop and prepare the fruits you are using. If you do not like tender soft bananas then wait and add them before serving. In a sauce pan add sauce ingredients, bring to a boil then simmer for 2-3 minutes until sauce is infused with the mint. Remove from heat strain and let it cool down completely. Add fruits in layer starting with bananas at the bottom then oranges and then top with the other fruits. Pour sauce over but do not toss fruits. Cover and refrigerate for an hour. Try to choose fruits that are equally ripe.It always feels weird to have pieces of fruits that are either too mushy or to crunchy. You can infuse the dressing with any herb of your choice. If you do not like mint, use basil, rosemary, thyme… etc. You can also flavor the dressing with vanilla, orange blossom water or rose water. I always like to serve mine with extra dressing on the side. For a fancier look you may want to garnish top with whipped cream. Strawberry jello cream cheese bundt. 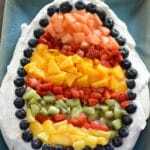 Zesty, minty easy fruit salad, healthy and naturally flavored. 2 medium oranges peeled and cut. 1 (16 oz/ 454g) container Strawberries. 1 pound (454g) diced Mangos. 1/2 cup (120ml) orange juice. In a sauce pan over medium high heat, bring sauce ingredients to a boil, reduce heat and simmer for about 2-3 minutes until the sauce is infused by the mint leaves. Turn heat off and strain.Set aside to cool down. Pour the sauce over, cover and refrigerate for an hour. Toss and serve with more sauce on the side if desired. Note1: You can skip the honey altogether if your fruits are sweet enough. Mangoes I have used was kind of sour but the rest of the fruits were sweet so I just used one Tablespoon of honey. Note2: you can increase the mint leaves or use a different herb like basil if you would like to. Also you can flavor the sauce with vanilla, orange blossom water or rose water. Note3: We love having a little bit tender- but not mushy- banana slices so I put them at the bottom so they will be soaked in the sauce as this will flavor the sauce with banana meanwhile keeping the bananas from changing color. If you do not like tender banana slices and want them firm, then delay adding the banana slices until the very end and add just add when you are ready to serve.